Alton Brown's White Trash Mix - white chocolate chex mix - HIGHLY addictive! Makes great neighbor or co-worker gifts. Chex, mixed nuts, cheerios, m&m candies, pretzels and white chocolate. A must for your holiday dessert tray! 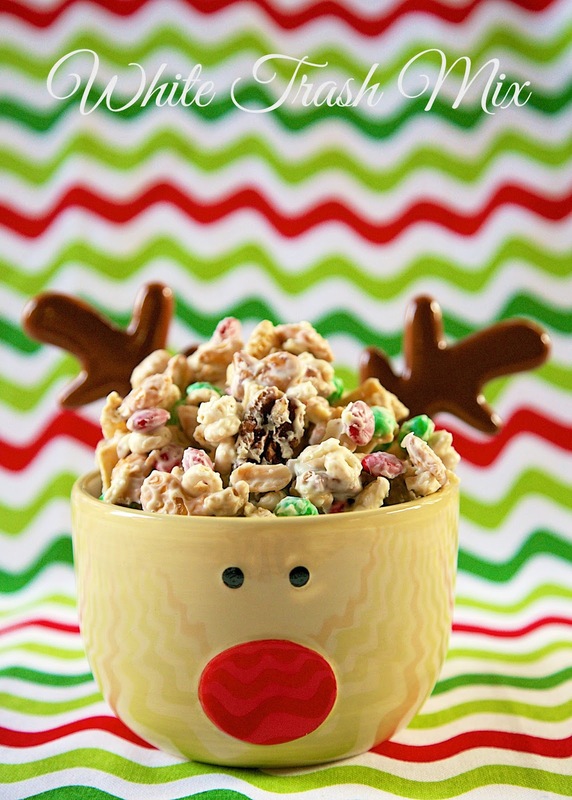 Everyone loves this no-bake holiday dessert recipe! A few years ago Alton Brown tweeted a copy of his mother's White Trash Mix recipe. I saved the tweet to make at a later date. That date finally rolled around, and I'm wondering why I waited so long! This White Trash Mix is basically a white chocolate chex mix. It is Chex cereal, Cheerios, M&Ms, mixed nuts tossed in white chocolate. It is also highly addictive! We could not stop eating this!! This only takes about 5 minutes to whip up. It makes a ton! 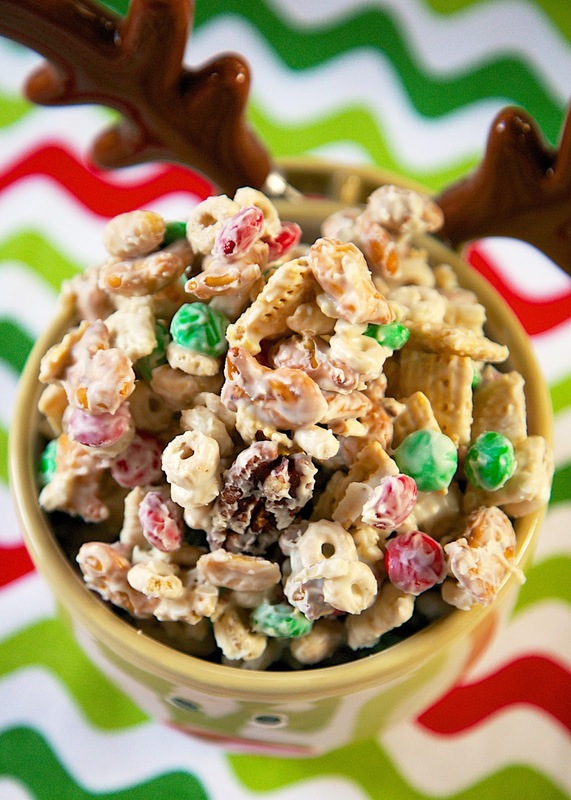 This White Trash Mix would be great at a party and also makes great teacher/co-worker/neighbor gifts. In a large bowl, toss together cereals, nuts, M&Ms, and pretzels. Melt white chocolate in a microwave safe bowl on HIGH for 1 minute. Stir. Continue heating chocolate in 30 second intervals until melted. Pour melted white chocolate over cereal mixture. Toss until fully coated. Pour coated mixture on foil, parchment or wax paper. Allow chocolate to set up. Break mixture into pieces. would it be just as good without the nuts because i am allergic. We make this without the mms. The white chocolate gives plenty of sweetness. A holiday favorite. Always a favorite in our house too! !